 30+ Tax Day freebies and deals to help you celebrate finishing your taxes! Though Tax Day is far being a favorite holiday, many retailers and restaurants are offering discounts and freebies to help you celebrate the finish of your taxes. If you’ve filed, breathe a sigh of relief, pat yourself on the back and go celebrate by taking advantage of some of these deals! And if you still need to file, here are some free ways to file, plus what to do when you can’t pay your taxes. Enjoy these Tax Day freebies and deals on April 15! Applebee’s: Enjoy $1 strawberry margaritas all month long at participating restaurants! Amazon Restaurants: Use code EAT7 for $7 off your first order from Amazon Restaurants. Bananas Smoothies & Frozen Yogurt: Enjoy a free small frozen yogurt at participating locations on April 15. Biaggi’s: Enjoy 20% off dine-in, carry-out and online orders with this coupon. Boston Market: This restaurant is offering a half-chicken, two sides, cornbread and a drink for just $10.40 through April 15. BurgerFi: Enjoy a BurgerFi Cheeseburger for $4.15 on Tax Day when you download the BurgerFi app. Bruegger’s Bagels: On tax day, claim 13 bagels and two tubs of cream cheese for just $10.40! This is valid April 10 through 15 at participating bakeries. Chili’s: Enjoy $5 Straw-Eddy margaritas this month, plus get free chips & salsa or a free drink every visit with My Chili’s Rewards. 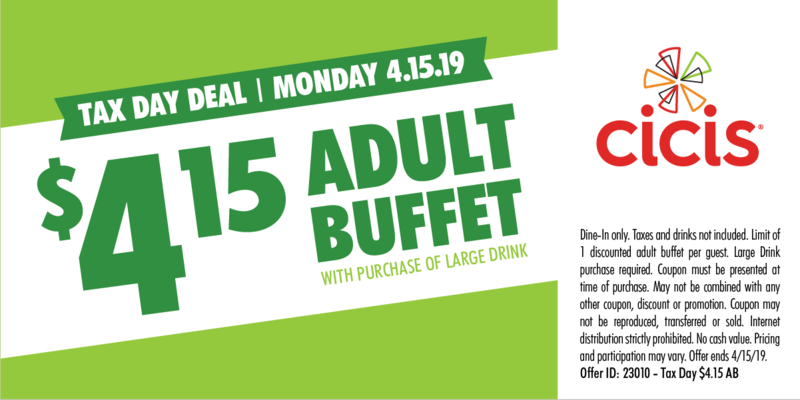 Cicis: Get an adult buffet for $4.15 with this coupon on April 15. Corner Bakery Cafe: Get two entrées for $10.40 on April 15 through 17 when you dine in at participating restaurants. DoorDash: This delivery company is offering new customers $20 off orders through the month of April. Farmer Boys: Participating locations are offering two double cheeseburgers or two breakfast burritos for $10.40 on April 15. Great American Cookies: Enjoy one free Original Chocolate Chip Cookie at participating stores on April 15. Hooters: Kids eat free with the purchase of an adult entrée of $15 or more through April 15. Hot Dog on a Stick: This restaurant is offering customers a free turkey or veggie hot dog on a stick on April 15. This deal is available at participating locations and you must mention the offer to get the deal. Hungry Howie’s: This pizza joint is offering a large two-topping carry-out pizza for $7.99 when you use code LG799. Customers can also get 3-cheese Howie Bread for $0.99 with any $12 purchase with code 99CHEEZ. Kona Ice: Select locations are offering free shaved ice on April 15. McDonald’s: Buy one Big Mac, get one for $0.50 with the McDonald’s app through April 28. Menchie’s: Download the Menchie’s app by April 15 and get a free frozen yogurt up to $5. Noodles & Company: NoodlesRewards members can take $4 off orders of $10 or more with the NoodlesRewards app. P.F. Chang’s: Take $10 off orders of $50 or more when you order online with code TENOFF through April 21. Pizza Hut: Through April 15, Pizza Hut is offering large 2-topping pizzas for only $5.99 when you order carry out online. Postmates: Use code DRAGONS for $100 in delivery credit for new customers. Potbelly Sandwich Shop: Buy one entrée, get one free when you mention Tax Day when ordering. Schlotzsky’s: Get a FREE small Original with purchase of chips and a medium drink on April 15 at participating locations! Seamless: New customers can get a $12 credit from Seamless delivery service during the month of April. Smoothie King: Enjoy $2 off any 20-ounce smoothie when you download the Smoothie King app April 15 through 18. Sonny’s BBQ: According to Sonny’s BBQ, IRS stands for Irresistible Ribs Special, and you’ll get it at Sonny’s for half price on April 15. Tilted Kilt: Enjoy $5 Jack and Cokes and $5 martinis through April 20. White Castle: This fast food joint is offering 15% off any in-store order with a coupon which will be posted on the restaurants Facebook page and sent to email subscribers. Kohl’s: Take an extra 20% off purchases of $100 or more with code USAVEMORE through April 17. Macy’s: Take 40% off women’s shoes when you buy two or more pairs with code GREAT. Office Depot/ Office Max: Shred up to five pounds of documents for free through April 27 with this coupon. Planet Fitness: Both members and non-members can enjoy a FREE hydromassage from now through April 20 with this coupon. Old Navy: Take 50% off dresses, shorts, tees and polos plus 40% off everything else when you shop online. Sears: Sears is having a Tax Day sale with 12% off everything online and in stores, in addition to $150 back in points when you spend $150, in 10 installments. Sephora: Get a free trial size of Urban Decay eyeshadow primer with orders of $25 or more.